Hells Gate State Park is a 960-acre property that acts as the gateway to the deepest river gorge in North America: Hells Canyon on the Snake River. The property is on the Idaho side of the Snake River and is probably at the lowest elevation in the state of Idaho: 733'. There are miles and miles of hiking, biking and horseback-riding trails in the area, plus a large beach and day-use area. Campers enjoy the many grassy campsites along the river's edge. The park's group use area can accommodate up to 300 people and offers a reservable covered shelter. 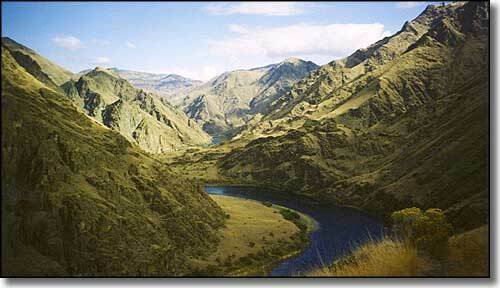 Several miles upriver from Hells Gate State Park is the wild and spectacular Hells Canyon Wilderness area. The easiest way to visit Hells Canyon is by jet boat, and many outfitters offer half day, full day, dinner and overnight boat trips that depart directly from the docks at Hells Gate State Park. You can also take dory and raft float trips through Hells Canyon that end at Hells Gate State Park. The Hells Gate Marina offers more than 100 boat slips with moorage, fuel, convenience store, restrooms and parking. There is also a public boat launch and boat rentals available. While the Snake River in this stretch is excellent for boating and water skiing, the fishing is also "to die for." Upper photo of Hells Canyon courtesy of X-Weinzar, CCA ShareAlike 3.0 License. 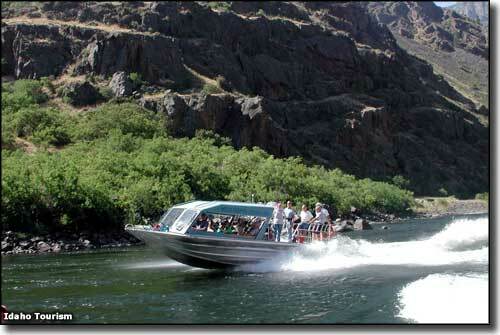 Lower photo of the tour boat at Hells Gate State Park courtesy of the Idaho Department of Tourism.